Every one of us holds some hope for a future America, indeed a future world, that is changed. Changed to what is not always as tangible as our minds would like it to be. 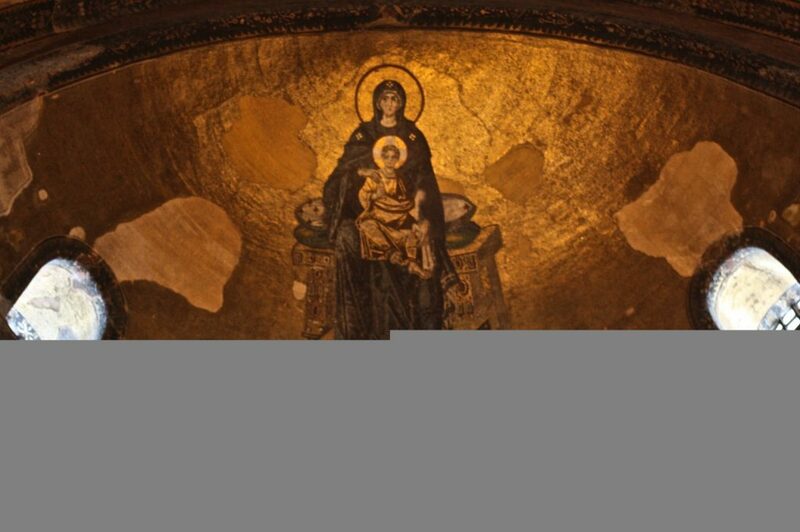 Perhaps that’s why Martin said “I have a dream…” In the best of expressions, Jesus Christ, depicted above with the Virgin Mary as a tiled mosiac in the Haghia Sophia, represents Hope. His birth brought Hope to a world that had gone awry, thus the title of the image “Child of Hope.” As agents & allies of social change, we, too, represent Hope for a world that has gone a little astray from the path of expressing the best humanity has to offer: love, compassion, fairness, security, sustainability and self-determination for all living things. We have our work cut out for us. But with a grounded theory, a willingness to learn the art and a committment to practice, practice, practice, we can and we will be our best and through our example, through our leadership, we’ll inspire the best in everyone. In keeping with a year-end “Best of…” theme, (while doing as little as possible as I head out in the world on the first leg of my sabbatical) I offer these snippets from not one, but all of the past year’s INcite essays. Take them individually or as one big riff on this profound movement towards Transformative Social Change. May any one of these ideas, instructions or inquiries inspire you towards being your best, today and in the year to come. On the one hand, 2009 brings with it the incredible challenges of the freefall of an economic house of cards built with smoke, mirrors and lots of dishonest spit, an unjust war built on outright lies, and a devastating attack on a people that the world can no longer deny is on the short end of a harsh stick, built on a 60 year theft. On the other hand, we are embarking upon a new year, a new era, and a strange, new hopefulness that real people, tired of being polarized by fear, hate and separation can organize for hope, progress and change. And together, our collective will can make a difference. President Obama has gone on record saying that he opposes gay marriage, but admits this may be a wrong-headed view drawn from his own religious beliefs. I’m suspicious of the idea that God whispers in anyone’s ear and says “you are chosen to have something that other’s aren’t entitled to:” be that right to love or right to land. But since I’ve only been trying to listen to God rather than talk, maybe She doesn’t whisper back to me. So, I’m not one to question Obama’s or anyone else’s personal relationship with God…why don’t we stop questioning anyone’s personal, mutually respectful, consenting relationship with anyone else? March | can you see me now? Being in real relationship with “the other” closes the bias gap…But to even get there, we have to look at ourselves first. We have to stop letting ourselves off the race hook and commit to actively resisting the biased waters we swim in by raising our unconscious, implicit fears to the level of conscious, explicitly articulated ones. That’s painful, exhausting, heart-breaking work, but it’s the real work that needs to be done. No less important than your next action, petition, campaign or board meeting. (Those explicit biases could use a good eyeballing here, too.) Plainly speaking, if you’re doing work for change in what’s “affectionately” referred to as AmeriKKKa without a practice of examining race, you’re pretty much adding to the problem. The Watchmen for Change are made up of Freedom Fighters, Organizers, Agitators and Activists paired with the folks that, like it or not, foot the bills. In a perfected partnership, they are our Supporters, Advocates, Advisors and Allies. Some of us pay with the currency of creativity, vitality, energy and soulforce. Others pay with hopefulness, steadfastness, wild cheering and dollar bills, y’all…Together we are the Jedis of Justice. We are The Ones that We have Been Waiting for to illuminate the Matrix and reveal the passage out of Babylon. We are the Agents of Transformative Social Change. A Black Organizer is in the White House. (Wise Latina) Justice is getting off the bench and in the Game. It’s our time. The era of the lowly grunt that toils for justice being the under-appreciated, underpaid underdog is officially overrated. We are now the wunderkinds that can capture the imagination of our nation with our unwavering commitment to Hope, resounding call for Freedom and heart-stopping effort to reveal Truth, Justice and a truly New American Way. (And) when Death comes to Friend you, as it will, you can’t ignore it. Where will your vast but virtual network be then? Will they be there to sing songs, share stories and send your ashes back to ashes, and dust back to dust? Will they memorialize you? Yes, connections can be made quick, Friends, Followers and Fans, but relationships are still slow…and the best ones are grown over time. This is, more often than not, the nature of deep practice: It isn’t convenient. It doesn’t fit your schedule. It doesn’t conform to your whim. It isn’t selectable for good days instead of bad. In short, it isn’t a hobby…it’s a practice. If not as dramatic, remaining committed to established personal and organizational practice–especially in the face of challenge–is a stance no less determined than that of Gandhi’s Salt Marchers, or those folks that continued to cross the bridge in Selma. We put our butts on the line and on the cushion to usher forth a new way of Being Change. Unlike change, which can be undone with a shift in context or the swipe of a presidential pen, there’s no going back on transformation. The depth of change that takes place is so deep, rooted and resounding, that the former way of being is no longer possible. While transformation can’t be undone…the decisive question we must ask is “Transformation towards what?” If we want positive transformative outcomes, we must intentionalize and work toward them. Deep change requires deep practice. Simply put, we have to stay with it in order to see transformation through. Through and through, we must weave the fabric of our movement culture with ways of being, knowing and doing that embody precisely how we want to see society transformed: into an equitable, sustainable and just place for all. How we are showing up right now is the state of our transformation. However, if you can imagine the exact outcome, it’s more likely to be change than transformation because our vision is necessarily limited by our current perspective and conditions. Transitions are the doorways to change. Choosing to engage transition and enter each doorway as consciously as possible, but with a willingness to not know what’s on the other end, is what makes that change intentional. Life IS change. And if you’ve been around for five good minutes, you know that Change Happens. So your only real choice is to either let life happen to you or for you to choose to live it. One way to do that is to become practiced at happily, humbly and heartily Meeting Change. Happy holidays. Free Palestine. Love, peace and blessings to and for all.